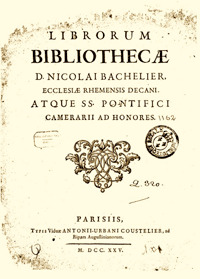 Canon and Dean of the Cathedral in Reims and honorary papal camerario, Nicolas Bachelier was a member of a family of bibliophiles that included Louis-Jean-Baptiste Bachelier, who collaborated with Pierre Bayle. Nicolas Bachelier’s library was begun by Claude Bachelier des Marets, who had bought several volumes from the library of Denis de Sallo, lord d’Hédouville and founder of the «Journal des Savants». The collection was then inherited by his brother Nicolas, who was canon in Reims and professor at the Sorbonne, and eventually by his nephew with the same name. He further enlarged the library, which grew to 35,000 volumes. Bibliography: J. Guigard, Le nouvel armorial du bibliophile, 2 vol., Paris, Rondeau 1890, p. 28. Catalogus librorum bibliothecae D. Nicolai Bachelier ..., Parisiis, typ. Viduæ A.-U. Coustelier 1725, in-4°.